Idli Sambhar and coconut chutney....a perfect and most nutritious morning meal. 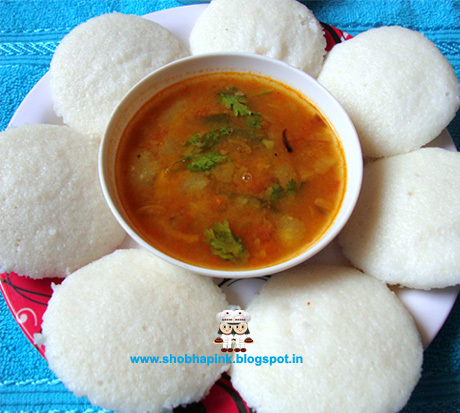 Idli Sambhar is a South Indian delight light on the stomach and easy to digest. 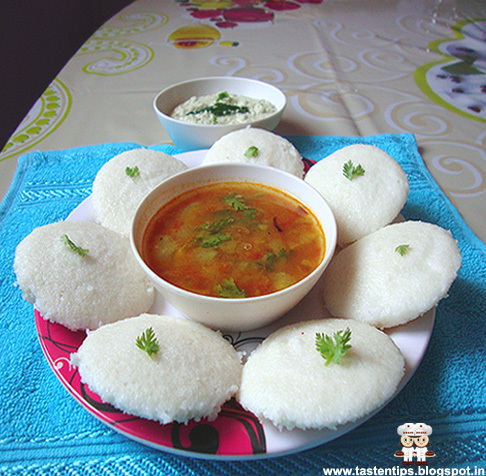 Idli Sambhar is one of the most popular traditional South Indian dish. 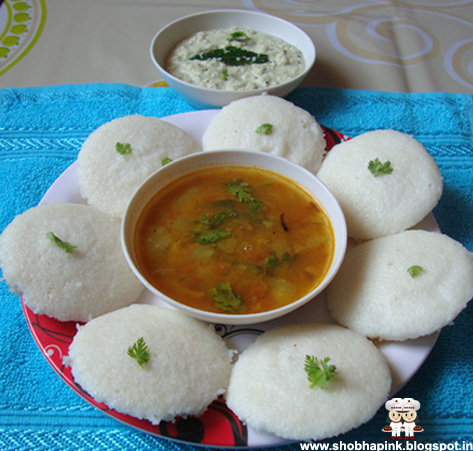 Idli prepared with fermented batter of rice and black gram dal( urd dal), sambhar made from pigeon peas (toovar dal), vegetables, tamarind and spices. This dish is very easy to prepare and can be served as main course, side dish or breakfast. Its a prefect meal itself. 1. Clean, wash, soak urad dal and fenugreek seeds in water for 4-5 hours. 2. Clean, wash & soak rice in water for 4-5 hours. 4. Pour this paste to a big bowl. 5. Now add rice to same grinder with water and make a smooth paste. 6. Add this paste to dal paste and mix well. 7. Keep this paste for fermentation overnight. 8. For preparing idli add salt to idli paste and mix well. 9. Heat the idli steamer, add some water and let the water boil. 11. Steam idlies for 10-12 mins. 12. Wet a knife, remove each idli with the help of knife and place it in a plate. 13. 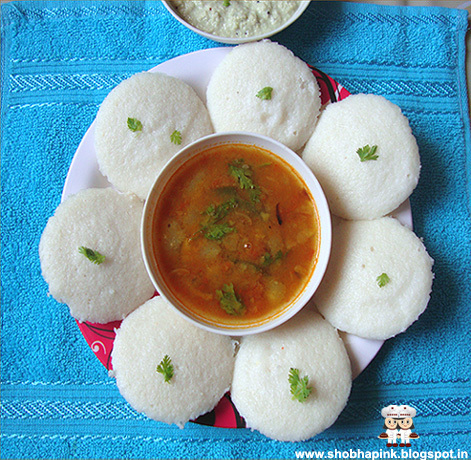 Serve hot idli with sambhar and coconut chutney. tomato, pumpkin, water and cook it till done. crackle, add onion, cook till it become golden brown. 3. Now add red chili powder, cooked dal, vegetables and mix well. 5. Let it come to a boil and cook for another 2-3 mins. 6. Serve hot sambhar with idli and coconut chutney. 2. Sugar can be added to sambhar, if you are fond of sweetness. cooker and don't forget to remove whistle. 5. Don't over ferment idli batter otherwise idli will become sour. Wow,one comforting platter.. well made. all time comforting meal!! love it!! They look so soft and perfectly cooked! My all time comfort breakfast...can have it for every meal!! Idly sambar looks delicious love it.